Earth's first line of defense against the DECEPTICONS is here! 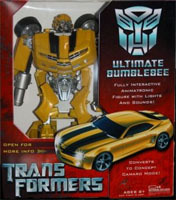 Hidden from his enemies in vehicle mode, BUMBLEBEE waits and watches until he is called upon to protect Sam and any other humans that come under threat from MEGATRON. He is a cunning warrior against evil, and dedicated to those he calls his friends. When danger threatens, he converts to robot mode with his plasma cannon blazing!